The two main Switch Rooms for this tissue mill were located on two floors and housed a large number of variable speed inverter drives. These were cooled using a ducted air handling system with a Direct Expansion (DX) Cooling System consuming around 15KW of power. 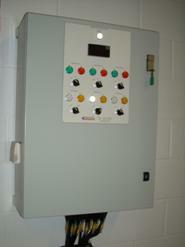 As the amount of switchgear had increased, this system became unable to control the internal temperature in warmer weather. In looking for a solution to their increased cooling needs, Kimberly-Clark was also keen to reduce their carbon footprint. 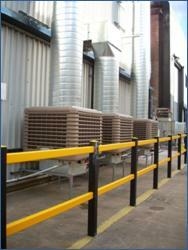 Ventilation alone would be incapable of maintaining a required maximum temperature of 25oC. Refrigerant based cooling proved too expensive in terms of capital and long-term running cost. Ensol installed four Evaporative Cooling Systems ducted externally to deliver cooled air to the Switch Rooms all year round. Warm air is removed from high level using four Ensol Louvred Wall Extract Units to provide a balanced ventilation system with a slight positive pressure to help prevent dust ingress. 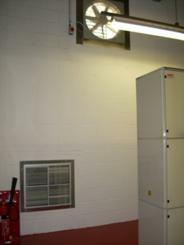 A central control panel in each room varies the cooler and extract fan speeds dependent upon the room temperature. The new Ensol system only draws a maximum of 6KW of power at full load, thus drastically reducing the running costs and carbon footprint whilst at the same time delivering over 120KW of cooling capacity. The system also consistently maintains the temperature within a tolerance of +or – 1oC. The company are pleased with the installation on both performance and reliability and are now experiencing the benefit of vastly reduced maintenance & running costs.